Skiing with kids needn’t fill you with dread. With some insider knowledge of the best childcare options and resorts, it can be the perfect family holiday. We've teamed up with Anna Sampson, mountain enthusiast, industry expert and founder of The Chalet Edit. 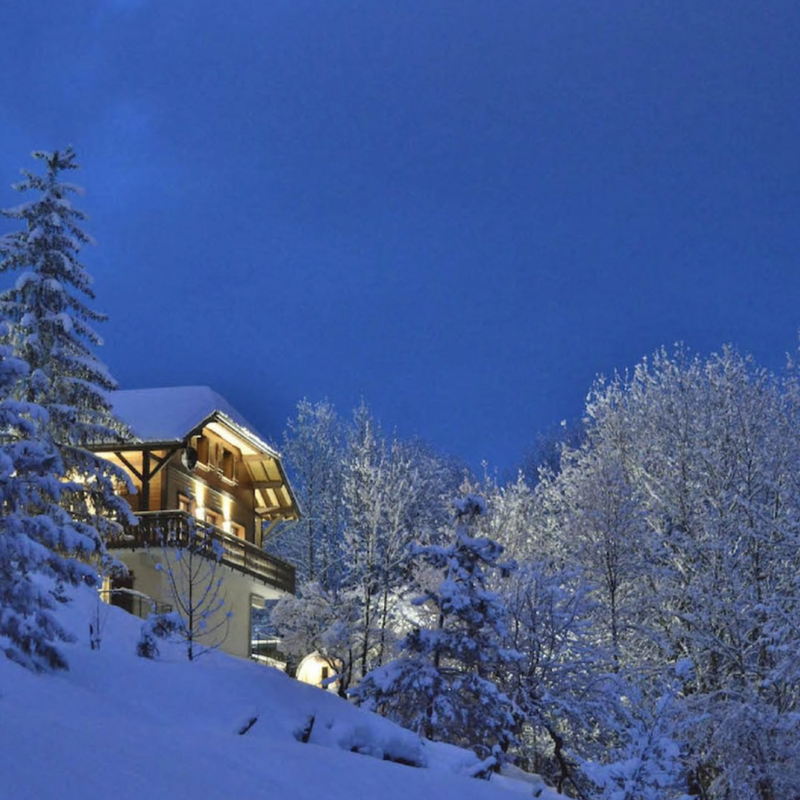 Her luxury ski chalet specialists takes the hassle out of finding your dream chalet by providing a full in-house concierge service from start to finish. They'll organise everything from ski school, transfers and in-resort childcare to amazing off-slope excursions and activities. 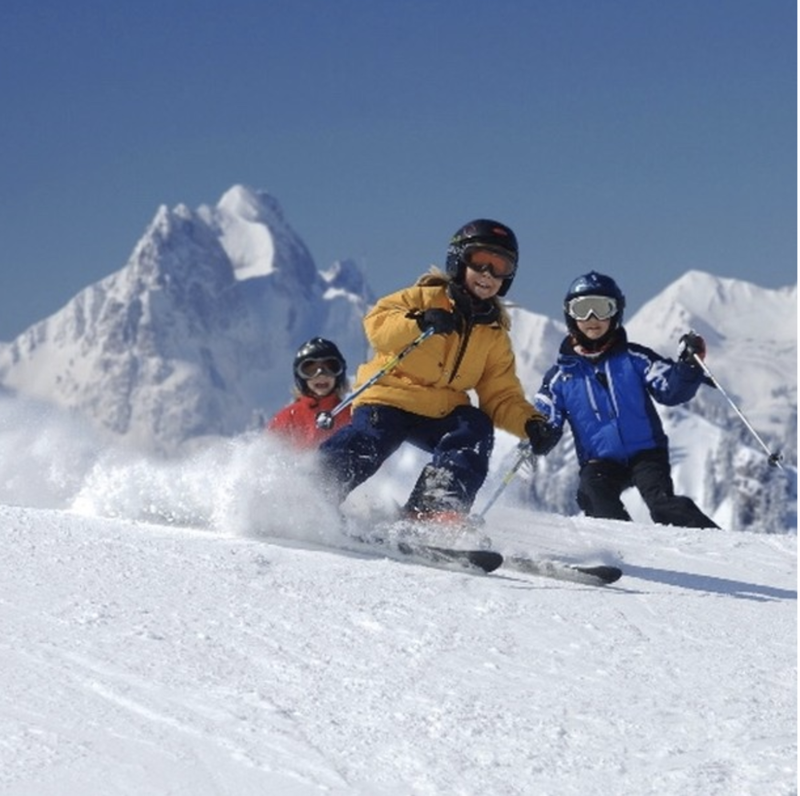 Here, Anna offers her insights on how to plan the perfect ski escape with kids. Don’t head to the slopes without it. 1. When’s the best time to go skiing with kids? Easter is a fabulous time of year to ski. It's beautifully sunny and if you head to the right resort the snow can be just as good, if not better, as it tends to be less compact and icy as the sun thaws the snow later in the day. The beauty of Easter skiing with kids is being able to sit outside and have lunch in the warmth of the spring sun. It's a great time of year to teach children to ski too, minus ice cold hands and feet. However, skiing at this time of year does mean that high altitude resorts are a must to ensure the snow, so be warned that will usually mean a longer transfer from the airport to resort. 2. At what age can kids start skiing lessons? Watch out with this. Many parents would love their two-year-olds to start skiing but it simply isn't possible in ski school groups, no matter how advanced they are. Two-year-olds would only be able to take to the slopes with a private instructor, which is extremely pricey. Ski school starts from three-years-old in Austria and Switzerland and some resorts in France have ESF offering Piou Piou (snow kindergarten). Some French ESF schools include lunch and lunchtime supervision, enabling parents to ski all day. 3. What are the best resorts for what age group, from toddler to teen? For toddlers (12 - 36 months) Morzine is perfect. It has a huge fairly flat nursery slope area on the Pleney side down in the village, with ESF offering Piou Piou (snow kindergarden) for three-year-olds during the school holidays. It is a gated area that includes fun equipment, figurines and a small 'magic carpet' travelator to promote learning. Three-year-olds you can choose half or full days, with or without lunch, and there’s a great indoor play area to keep kids warm and entertained through the day with painting and plenty of educational games on offer. Take note: if you wish for your three-year-old to ski, many clubs will only take children who are potty trained without nappies. For three to five-year-olds Val d'Isere has a wonderful flat nursery slope in the centre of the resort designed for young children called the snow garden which is run by ESF. Children are accommodated in groups of up to six children per instructor (eight during school holidays) in a gated area that includes fun equipment, figurines and a small 'magic carpet' travelator to promote learning. It's best to note that during the school holidays they only take children from three-and-a-half years old. Once kids have progressed from the 'magic carpet', there is a small chairlift and drag lift on the nursery slope that will give them a taste of skiing longer runs. For teenagers (13 years and above) Meribel is perfect with lots of wide open slopes and plenty of cool ski schools offering teen focused classes and the possibility for them to try freeride classes and jumping onto an air bag. Older teens may be keen for nightlife and there is certainly no shortage of that in this buzzy resort. 4. What childcare options are there? Private nannies are great for all day care for little ones and perfect for after ski school pick up. Nannies are restricted to the number of children they can look after depending on the age and number of the little ones. These companies are always run by trained NNEB qualified professionals. Ski school is good for children who have learnt to ski at a young age and are advancing or for anyone four and over who is taking to skis for the first time. Many ski schools also offer teen camps and improver courses. Ask your ski specialist to help advise you. Snow Kindergarden provides skiing and childcare starting from three-years-old in some resorts. In-house creche is offered in some resorts for infants from as young as six months. These facilities offer all day childcare for little ones and activities. Some ski companies include all day childcare and ski lessons as part of the package. With trained childcare professionals to look after the kids during down time and evening kids clubs on offer. Just speak to your ski specialist to discuss the options available. 5. Any extra considerations when planning a skiing holiday with kids? Make sure you plan your stay well at the time of booking. Most of the chalet companies will have the cots, sterilisers and some toys but it's best to check in advance. Plan your transfers too, speak with your ski specialist about the sort of car seats you need or ask them if your not sure. Everything can easily be arranged in advance. Getting all the right kit is essential; make sure they have everything they need. Small children will loose everything easily so gloves that tie on to the jacket are really useful. Also give them a snack bar to take with them in their bag or pocket and an additional layer if they get cold. A snood is also better than a scarf for little ones, as it is more likely to stay on and not get lost. It’s best to hire helmets at the resort as they are bulky to pack and kids tend to grow out of them very quickly. Some children get really sick on the transfer journeys as they are long and winding going up to some of the high resorts, so be well prepared with i-pad games and movies and travel sickness pills. The last thing to note is if you have children with allergies it's best to bring special food and medication, as it's tricky to get these things in resort. The Chalet Edit creates exceptional, tailor-made ski-chalet holidays to Europe’s leading ski resorts including the Three Valleys, Chamonix, Verbier, Zermatt, Portes du Soleil, Espace Killy and many more. Holiday prices depend on party sizes and requirements. Created to guide and inspire guests, The Chalet Edit aims to remove the stress in finding and booking a luxury ski chalet. It has a carefully edited portfolio of luxurious chalets, an easy-to-use website clearly detailing each chalet and resort, a hassle free online experience and a first-class concierge service that ensures every holiday is the best yet. Each chalet listed has been hand-picked and undergone a rigorous vetting process to ensure the edited portfolio is the best of the best in terms of design, offering and staff. The personal service starts right from the planning and ensures every holiday is completely tailor-made. With expert knowledge of each destination, the team works around-the-clock tapping into their trusted network of tried and tested partners and worrying about the little things before guests have even thought of them. From transfers and ski school to the best hidden mountain restaurant bookings and VIP tables at the liveliest après ski stops, as well as organising private nannies, heli-skiing and off-piste husky sledding adventures. The Chalet Edit can do it all and more. Picture credits. From top to bottom, left to right; 1. Val d'Isere Tourism; 2. Lech Zuers Tourismus by Christoph Schoech; 3. Gstaad Tourism - Alpine Ballooning; 4. Les Gets Tourism; 5. Gstaad Tourism; 6. Chalet Twenty26, Morzine - The Boutique Chalet company. 7. Lech Zuers Tourismus by Christoph Schoech. 8. Courchevel Tourism - Bataille Neige by Alexis Cornu. All images supplied courtesy of The Chalet Edit.